You finally decided that’s it’s time to upgrade your ClickFunnels plan. Maybe because you want access to Actionetics or Backpack. Or you just want to be able to add more than 20 funnels in your account. Do you just login to your ClickFunnels account and upgrade yourself to the $297 plan from there? Funnel Hacks is currently the best deal on the ClickFunnels Etison Suite Plan, and definitely something you want to consider if you are planning to upgrade. Not if you want save yourself some money and access extra training to get even more out of your ClickFunnels account. That’s because ClickFunnels has a much better offer for people looking to upgrade from the standard plan. It’s called Funnel Hacks and in this review, I’ll show you what it is all about and why it was the offer I ultimately decided to go with for my own business. As of March 2019, Funnel Hacks has been discontinued and replaced by Funnel Builder Secrets. I’ll be leaving this review up, but all the Funnel Hacks links in this post will redirect to Funnel Builder Secrets. Here’s what I am going to cover in this Funnel Hacks review. If you’re already ready to buy, skip to the end of this review and grab my $18,570.95 ClickFunnels Bonus Package. Funnel Hacks is one of the two main offers that centers around the $297/mo Etison Suite plan. The other being Funnel Builder Secrets. There’s also a full 30 day money back guarantee on the offer as well. Keep in mind that ClickFunnels may or may not be phasing out Funnel Hacks from their plans. It looks like they are encouraging their affiliates to promote the Funnel Builder Secrets offer, as they’ve taken out the Funnel Hacks affiliate links from the dashboard. However, as of now the Funnel Hacks links still continue to work. I’ve been a ClickFunnels member for a few years using their standard plan. But within the last 6 months, I really wanted to make my push for the ClickFunnels dream car. One of the best strategies I’ve found to get more ClickFunnels affiliates is to leverage the power of share funnels. By offering valuable, relevant share funnels I started to see that I could get more people to sign up for ClickFunnels under my link. So I came up with this idea. To create a ClickFunnels Share Funnel Library that I could use as a really cool lead magnet and bonus. What I would do is scour the web for the very best share funnels that people were offering and create this amazing resource that would be valuable for people new to ClickFunnels. But I soon hit a problem. The standard ClickFunnels plan only lets you add 20 funnels at one time. And I wanted to add way more funnels than that. It became super frustrating because I had to decide what funnels to archive and what to keep in order to stay under that limit. The obvious solution was to upgrade my plan to the Etison Suite plan with unlimited funnels. But going from $97 a month to $297 a month is a really large jump. And for a large monthly payment like this, I wanted to make sure I would be getting as much value as I could for my investment. I first took a look at Funnel Builder Secrets. For $2997 I could get a full year of Etison Suite plan free and I would get access to a boatload of trainings including the Funnel Hacks Masterclass, Traffic Secrets and also a full year of Funnel Scripts. If you calculate that out, that brings the cost of the Etison Suite plan down to $250 a month. Pretty good deal right? That’s what I thought too, so I went ahead and bought it. But for my own affiliate business, the most valuable thing I have is my time. And while I wish I had time to go through more hours of training, I already have a backlog of courses I’m trying to get through. So after a couple weeks, I thought about it more and started to get buyers remorse. That’s when I started looking more closely into Funnel Hacks. It also offered a bunch of extra trainings, including the Funnel Hacks masterclass you get with FBS. But it was only $997 up front for 6 months of Etison Suite plan. Which drops the cost down to $166 a month. Plus I found out I could “renew” the purchase anytime before my 6-month expired, which is what really sold me. So I refunded my Funnel Builder Secrets purchase, got in on Funnel Hacks and I’m currently on this plan today. And since then I’ve come to realize that Funnel Hacks is the best deal for anyone who wants to focus their main business around ClickFunnels. I now have close to 100 funnels in my account, and I was able to finish my CF Share Funnel Library. It’s been one of my best performing lead magnets and has become a big part of my success in promoting ClickFunnels as an affiliate. If you want a free copy, check out my FB group, Affiliate Profits Mastermind. Besides the free 6 months of Etison Suite access you also get access to some additional trainings. I’m going to show you what’s inside each training and what they cover. 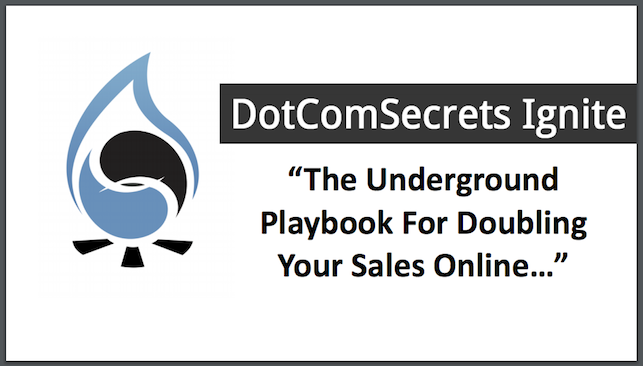 DotComSecrets Ignite is a 3 hr video training that helps you understand the principles of Funnel Building. Inside Russell covers 9 different funnels, how they work and how they reach with each other. The Funnel Hacks Master Class contains everything you want to know about building funnels. A separate membership site that contains working and proven traffic sources. The videos are updated as new methods and strategies are uncovered. Inception Secrets is also located in a separate membership site. The course teaches you the new way to sell online and helps you to create a structure and story where people don’t feel like they’re being sold something. Russell gives you these exact scripts and processes that get people to have that epiphany themselves, which compels them to buy your offer. If you are looking to upgrade to the ClickFunnels Etison Suite plan, then you should consider both Funnel Hacks or Funnel Builder Secrets as a way to get a discount on your monthly cost. If you are someone that wants or needs the additional training, then the decision is a little more difficult. Both offers give you access to the Funnel Hacks Masterclass. But with Funnel Builder Secrets you also get Traffic Secrets and access to Funnel scripts which are quite valuable themselves. But you have to consider the higher up front investment of Funnel Builder Secrets. For people that just care about upgrading their Etison Suite plan, then going with Funnel Hacks is a no brainer. By paying up front, you can reduce the cost of your plan to $166 a month which is a significant savings. As for me, I’m quite happy that I upgraded to Funnel Hacks. It was well worth it in my mind, and I will continue to re-purchase it as long as it’s available. Did my Funnel Hacks review get you interested in taking that free 14-day ClickFunnels trial? Why not get some extra help to start your ClickFunnels journey with these exclusive Funnel Hacks bonuses. By grabbing my bonuses, you will save yourself so much time and provide a ton of extra value with a minimal amount of effort on your part. I guarantee they will help you achieve better success with promoting Funnel Hacks as an affiliate. Affiliate Disclaimer: I hope you enjoyed this Funnel Hacks review. Please note that any links inside this article may be affiliate links for Funnel Hacks. That means that if you click on one of the links and sign up, I may be compensated for it. If you do happen to click, thanks! Any money we make keeps this site running and allows us to keep producing high-quality reviews.